Flashback to last week, during the storm. Remember how Robin Davies and Willow Fitzgerald drove Allan Delaney the 70 miles back down to Thule Air Base last week in the Tucker in the storm? Allan was to be extracted from the traverse via helicopter, but of course weather fouled that plan and so the team reverted to Plan B, an overland return--remember?So Robin and Willow were pinned in Thule overnight as the storm raged on. They managed to avoid a second overnight at the base when they scooted out of town during a momentary break in the weather. 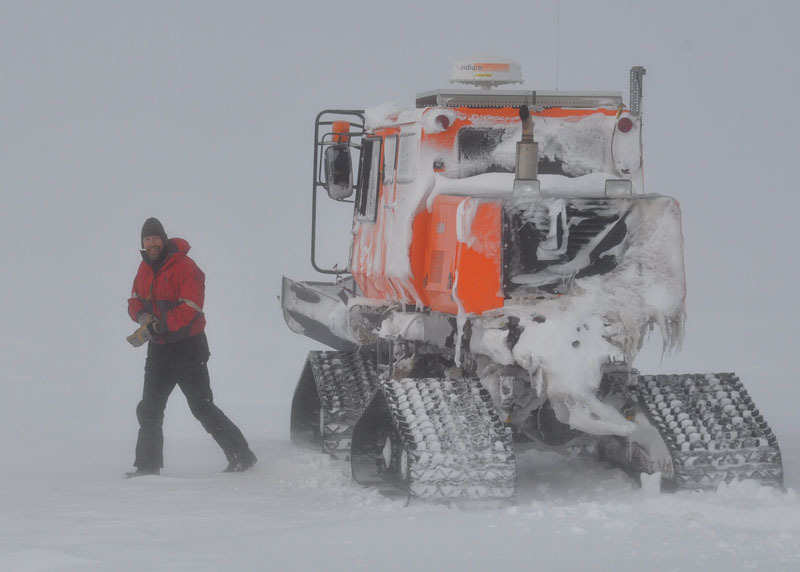 Up on the ice sheet, the storm continued, but the two were able to navigate using the Garmen 695 GPS units NSF purchased for moments just like these. We don't have any pictures of this portion of the adventure because Robin forgot to bring his camera with him--an uncharacteristic moment of forgetfulness for the GrIT photographer. But all's well that ends well, because the Swing Boss was ready with Robin's camera when the heroes returned. He took all of the pictures in this post. Who is he? Ask the Swing Boss.